We’ve been having quite the discussion about manipulation on the blog lately. For what it’s worth everyone can believe what they want to believe. What I do know is that no amount of manipulation can stop a secular trend. I think Greenspan and Bernanke have proven that fact explicitly. Between the two of them they have printed literally trillions and trillions of dollars in a vain attempt to halt the bear market. It hasn’t worked and it’s not going to work. All its done is make our problems much worse than they had to be. Ultimately the secular bear market will not end until stocks become cheap. The longer we fight that process the worse it’s going to be in the end. But back to the manipulation theme. Just as an example back in the spring of last year the Fed openly stated their intent to artificially hold interest rates down. They were determined to print as much money as needed to support the bond market and consequently drive rates down (interest rates move inversely to bond price). Let me show you what they accomplished. 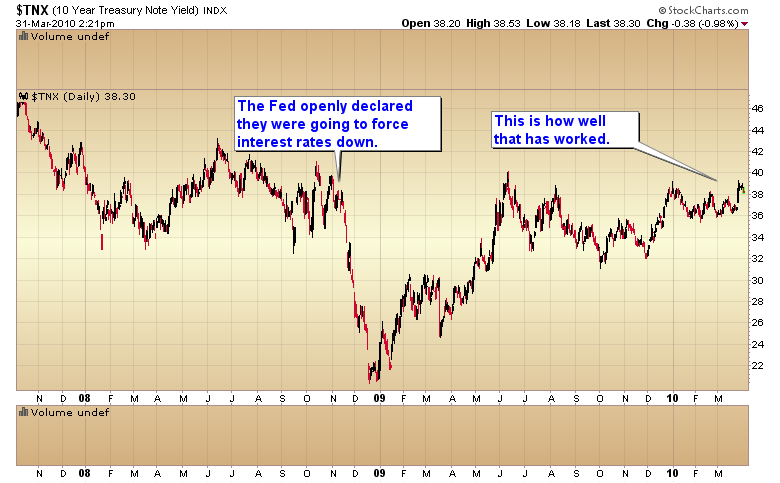 What they accomplished was to put in a final top in the almost 30 year bull market in bonds. Let me show you another one. 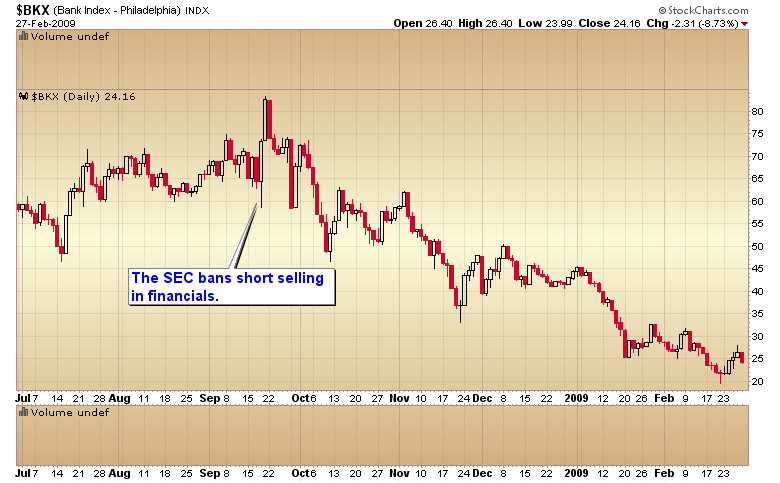 In Sept of 08 the SEC in its infinite wisdom decided to ban short selling in financial stocks. The end result? Financials dropped much farther than they would have naturally. Folks let me tell you right here and now whenever you see or hear about the government managing any financial asset run, don’t walk, to take the opposite side of that trade. 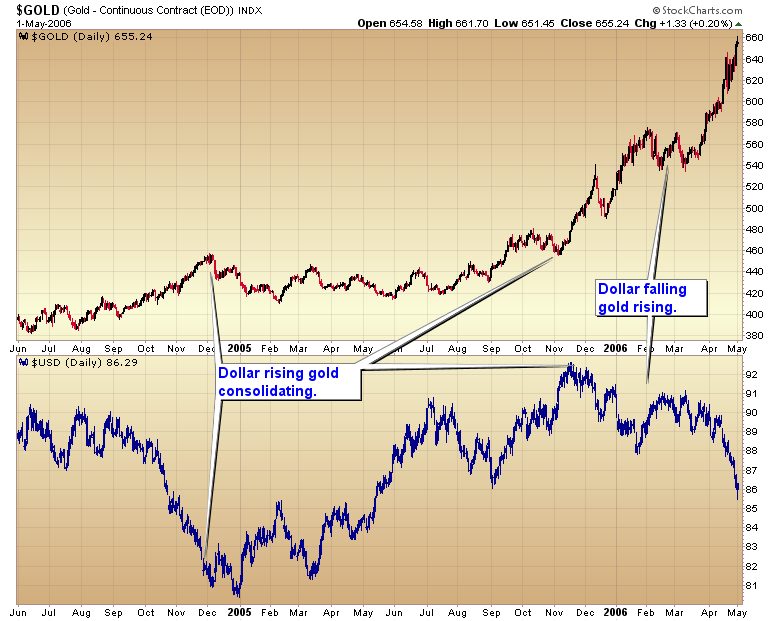 Now the big stink is that gold is being manipulated. For our sake I hope so. 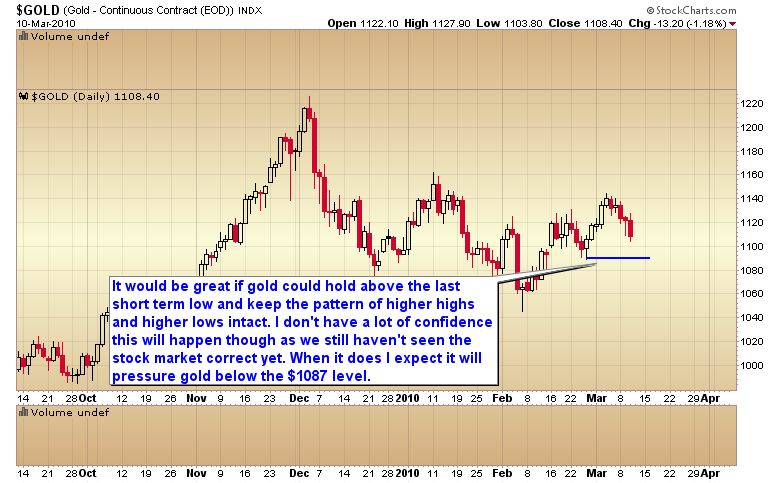 It will mean that gold will go up much much further than it would all on its own. If one is interested in the topic they kind find innumerable articles, interviews, papers and speculation purported to “prove” the fact at the GATA website. A website basically dedicated to exposing said manipulation. I guess it’s no surprise they have a mountain of “evidence”. But let me just throw out one warning. This is one of the oldest tricks in the book. As long as one can lay the blame for any mistakes on some mysterious manipulators they never have to take responsibility for any bad calls. Hey it’s not our fault gold didn’t go to $1300 like we said the government is suppressing gold. Fact is any manipulation to depress price below the natural level of the market will only increase demand. Let’s face it no one controls demand. Any attempt to force price lower than where it should fall normally will just bring in more demand from China, India, Europe, investors, etc. If the governement is actually trying to control the price of gold it just means gold will go much higher than it would normally . We can only hope there is manipulation going on as it probably means gold will go to $10,000 instead of $5000. This entry was posted in Uncategorized on March 31, 2010 by Gary. Amazingly enough…or maybe it’s not so amazing, every time gold corrects we see the conspiracy theories flying thick and heavy. I’ve asked this question I don’t know how many times and I have yet to receive a logical answer. Now that I think about it I don’t believe I’ve ever received any answer. If gold is being manipulated by the powers that be how in the world did it manage to rise from $250 to over $1200? I have to say if someone is manipulating the price of gold they are doing a damn poor job of it. I have to ask when gold was rallying hard last November where was the manipulation then? I didn’t hear a peep from the conspiracy crowd all month. When gold was rocketing higher in late 07 and early 08 where were the conspiracy buffs? Was there a conspiracy to raise the price of gold at that time? How about the monster rally in 05 and 06? How could this possibly happen if gold is being suppressed? Folks here’s the truth, virtually anything can be tampered with in the short term. It happens all the time. But no one and I mean no one can halt a secular bull or bear market. Case in point, Greenspan and Bernanke have printed literally trillions upon trillions of dollars in the vain attempt to halt the secular bear market and it has backfired every time. Just like it’s going to backfire this time too. Let me show you three charts. There’s nothing mysterious about the gold market. 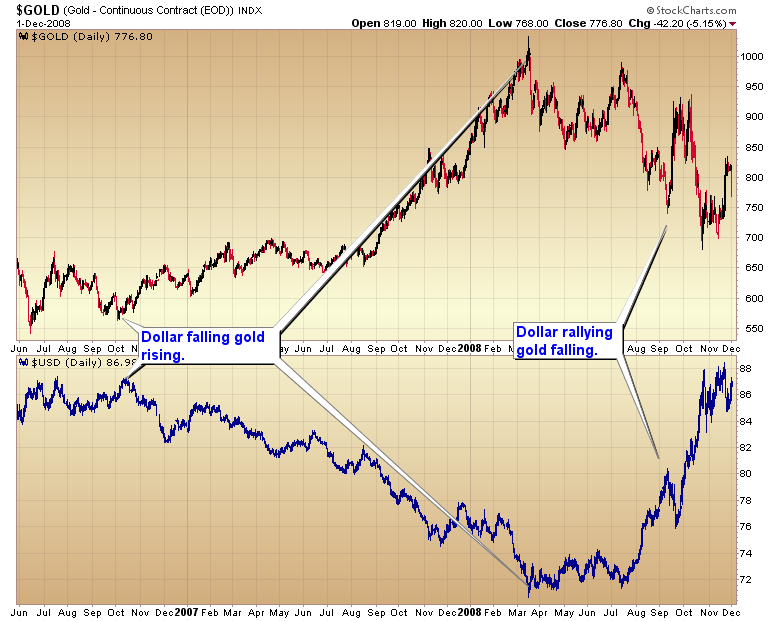 It’s simple, when the dollar is in its secular bear trend gold is in its secular bull trend. 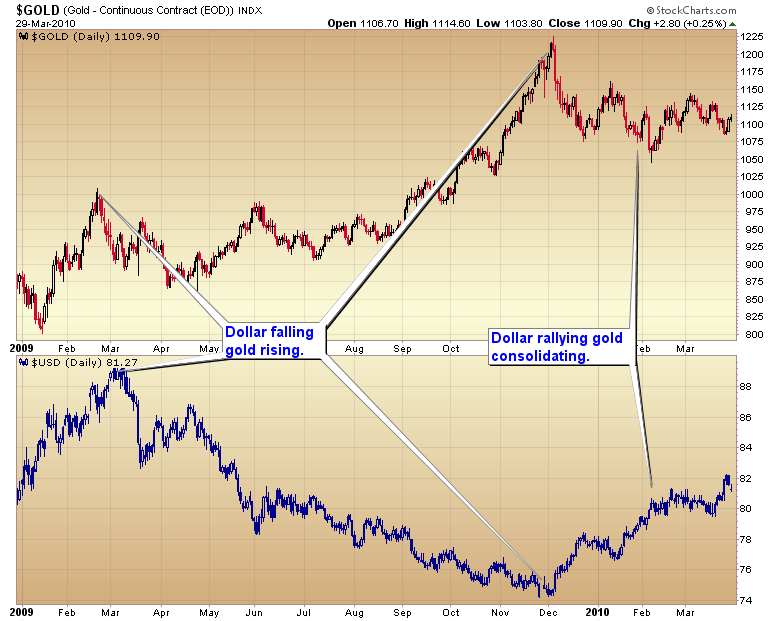 When the dollar is in a counter trend rally gold corrects or consolidates. It really is that simple. When gold gets extremely stretched above the mean it regresses, just like every other market in the world. Actually regression to the mean is the one principle in the stock market, or any market, that you can bet the farm on. When gold enters the final phase of a C-wave advance emotional traders spike the price irrationally far above the 200 DMA. Smart money when they see that happen start selling. There’s nothing evil about that. As a matter of fact it’s just good commonsense. So unless you think some mysterious force is also controlling the currency markets and the law of regression to the mean all in an effort to manage the price of the pitifully small precious metals market I’m going to suggest one get on with the business of making money and forget about this manipulation nonsense. This entry was posted in Uncategorized on March 30, 2010 by Gary. 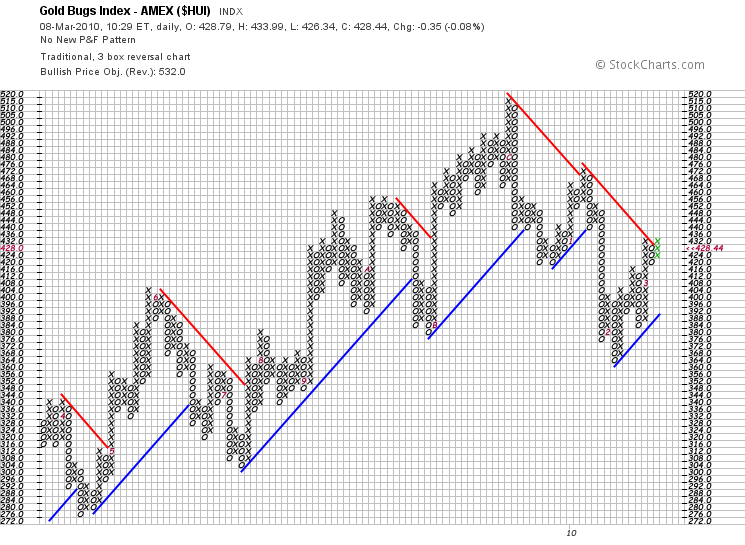 I’m going to start off with a few breadth charts. 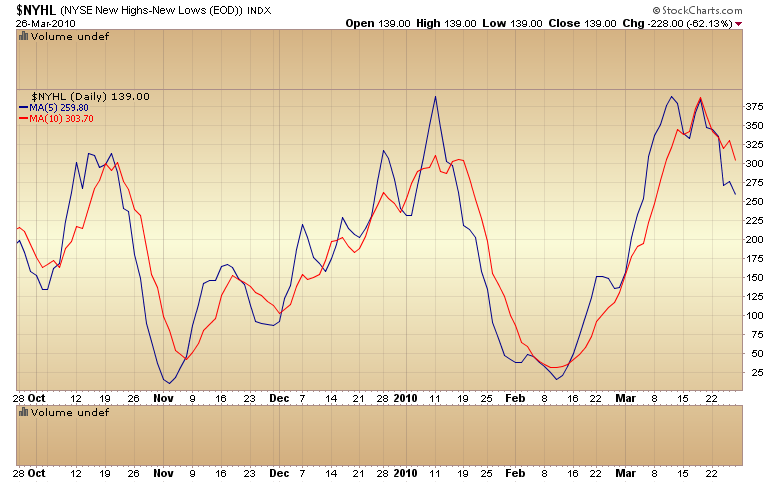 The NYSE new highs – new lows chart is now on a sell signal as both the slow and fast average have rolled over and are accelerating downward. Everything continues to point to an impending correction. The change in character the last two days is also suggestive that something is different. Instead of opening lower and rising through the day, the market has been gapping up but closing lower. This is a complete about face from what has been happening over the last two months. I will be monitoring sentiment as the market moves down into the correction. If investors get scared and panic quickly then this should be a short correction. If we were to get a sharp selloff this is what I would expect to happen. I’m talking 50+ S&P 500 points in 3 or 4 days. If, however, investors have gotten locked into a buy the dip mentality it could slow the rate of decline and we might be looking at something lasting closer to 10 or more days. I will say that what usually happens after one of these extreme momentum moves is that everyone heads for the door at the same time. The correction tends to be scary but over quickly as everyone panics all at once. That’s what happened in February 2007 during the mini crash following the runaway move. 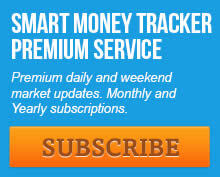 The market gave back four months of gains in 8 days. Now I don’t think we are going to give back 4 months of gains (this is only a daily cycle low not an intermediate cycle low), but I do think we could quickly fill the March 5th gap, which would be a 60 point loss. If that happened in 5 or 6 days it should be enough to swing the bullish sentiment all the way back to the extreme negative side of the boat. The market desperately needs to reset sentiment by going through another mini profit taking period and the sharper the correction, the better. I’ve warned many times that the intermediate correction separating the second and third leg of the bull was only going to be a profit taking correction that would soon be recovered. However, and as expected, while we were going through the last correction I had multiple traders inform me that this was the onset of another deflationary collapse. Heck, I’m still seeing articles on the internet predicting another deflationary collapse any day now. Often these predictions of disaster are associated with some imaginary trend line dating back to the 1970’s or 1980’s. I’ve even seen one site that based their predictions of an impending bear market on a trend line originating in the 30’s. I have to ask, how many people from the 1930’s are still trading stocks and are there enough of them to really effect the markets? I have no earthly idea why a trend line starting back in the depression should have any significance at all to today’s market. Geez, some of the crazy stuff one sees in this business. It’s enough to make you wonder if common sense is dead. I must say after watching both the tech and real estate bubbles expand and listening to the irrational reasons analysts gave at the time for why they weren’t bubbles, I have to think common sense is becoming a rare commodity in this day and age. I’m going to let you in on a secret. Bull markets don’t end because of lines on a chart or Fibonacci retracements or anything technical related for that matter. Bull markets end when a fundamental shift occurs. They end when something breaks. In a secular bear market like we have been in since 2000 that fundamental shift almost invariably leads to a severe bear leg down in stocks and the onset of a recession…or worse. We saw the first leg of the secular bear begin in 2000 as the world realized tech stocks were ridiculously overpriced, along with Greenspan’s monetary policies spiking the price of oil. The end result was a severe bear market and a recession. We saw this again more recently as the credit and real estate bubbles burst. This was then exacerbated by Bernanke’s insane monetary response which, of course, did nothing to stop either one of those bubbles from bursting. All Bernanke’s monetary response did was spike the price of oil to $150 and made sure we would have a very severe recession. This is still a cyclical bull though and until we have a catalyst in place to kill it there is one game plan that should be followed. That game plan is one that everyone who has the slightest experience in the market should already know. In bull markets you BUY DIPs. And you continue buying dips until you see a fundamental change occur that is going to send us down into the next recession. So once we enter the correction (it may have started with last Thursday’s key reversal) we want to be buyers of that dip. (I’m going to outline a game plan in a minute). First off, let me state again that I seriously doubt the next leg down in the secular bear is going to come from a deflationary front. We’ve already gone down that road. Bernanke proved he can defeat deflation with his printing press. Heck, he proved he could abort a left translated four year cycle with the power of the printing press. I’m constantly getting into debates with traders pushing the deflation scenario. The fact remains that we had the worst deflationary period in 80 years and Bernanke halted it in 9 months. Bernanke halted deflation the same way Roosevelt halted deflation in the 30’s by debasing the currency. I can assure you that if the slightest hint of deflation reappears, Ben will crank up the presses again. So I just don’t see deflation as the catalyst for the end of this cyclical bull. The catalyst for the death of any bull market almost always comes from the area that is experiencing excesses. In 2000 the catalyst emerged when the tech sector cracked. Everyone had become convinced these companies were eventually going to make unimaginable amounts of money, while amazingly enough overlooking the fact that most of them were making no money and never really had any reasonable shot at ever making any money. They were just burning through capital and at an incredible rate. Once the world woke up and realized the emperor had no clothes, down we went. This collapse was exacerbated by Greenspan’s printing efforts to ward of the imagined 2000 contagion and had the unintended consequence of spiking the price of oil. The latest catalyst as I mentioned above came when the overheated real estate and credit markets imploded. So we have to ask ourselves, where is the excess this time? It certainly isn’t tech. The companies that are left are making money. It’s not the real estate markets. That bubble has already popped. And I don’t believe it is going to pop again. I doubt it’s going to come from the credit markets again, as people and banks are deleveraging now, and for years to come. Besides central banks have already figured out they can fix those problems by changing the accounting laws and by pumping liquidity. So where is the dam going to spring a leak from this time? What is the area that is experiencing massive excesses that will eventually come back to haunt us? I would say there are two. One of them is government debt. But I’m not sure that will cause problems though because governments control the printing presses. No matter how much debt they rack up they can always print enough additional money to pay it. That leads us to the heart of where I think the next catalyst is going to emerge. The one area of incredible excess is the currency markets. Let’s face it, every country in the world has been running the presses on overdrive since early 2008. This has created an ocean of liquidity covering the globe like no other time in history. It halted the deflationary spiral we were in last year. And it is certainly giving the illusion that good times are returning (heavy emphasis on illusion). But just like the credit bubble felt real nice while it was growing, there are going to be consequences for this excessive liquidity. The piper will eventually have to be paid. I expect it will start when a small or maybe even a medium sized country’s currency gets into trouble. Then, just as subprime infected the rest of the mortgage market, it will spread into other currencies. I strongly suspect the bull market will end when something breaks in the currency markets. So until we see that happen investors should continue to buy dips and ignore all the Chicken Little’s predicting the sky is falling because we are approaching a trend line from 1932 or because this is the third of a third wave or whatever hokey nonsense they imagine will start the next bear phase. As I have said, bear markets begin when the fundamentals break down, not when the technicals do. This entry was posted in Uncategorized on March 28, 2010 by Gary. This rally is now deep enough into the daily cycle that it has become dangerous to chase it any longer. Sentiment has reached bullish extremes, some of which rival the `07 top. Again not the kind of conditions that would warrant pressing the long side any longer. As much as I would like to see a continuation of the C-wave the odds are starting to pile up against it. 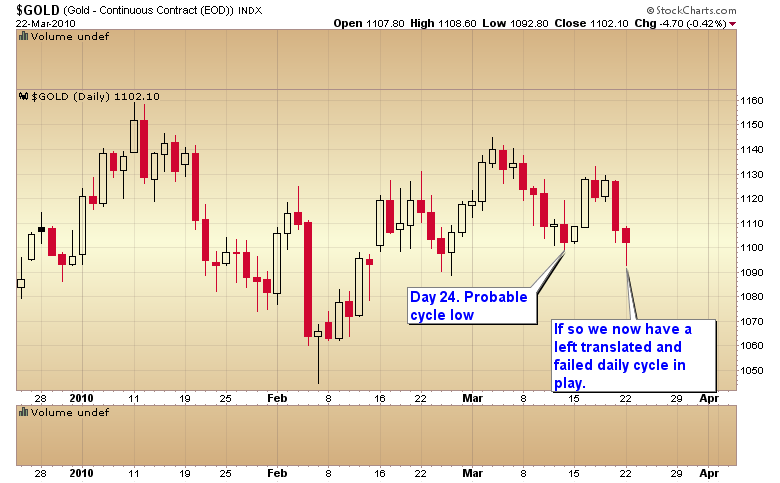 It appears that gold is now in the process of putting in a left translated daily cycle. 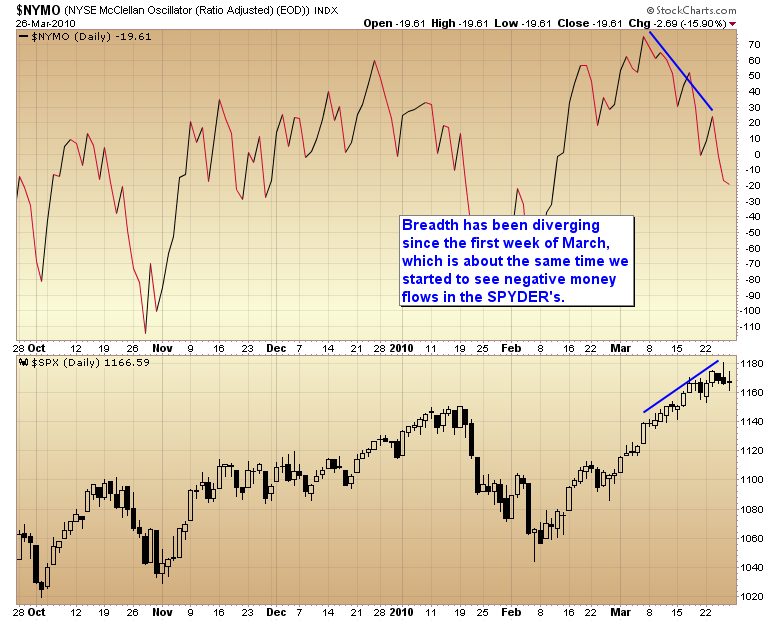 Today’s move under the March 12th low is likely suggesting this cycle has already failed. The bad news is this is starting to look more and more like a D-wave. The good news is that it will probably bottom in the next couple of weeks along with stocks when the market moves down into the next daily cycle low. We should then begin the next A-wave advance. Those are usually fairly powerful. Often testing the highs in fairly short order. If miners can hold above their February lows as gold breaks to new lows it would be a very bullish sign that the A-wave was ready to begin. For the time being the safest position is in cash as we wait for the stock market to correct. This entry was posted in Uncategorized on March 23, 2010 by Gary. Today will be the 28th day of the rally out of the February 5th bottom. We are now in the trading band for the daily cycle in stocks to bottom. (The cycle rarely lasts much longer than 35-40 days.) So like I said in my last post we are due for a short breather any time now. 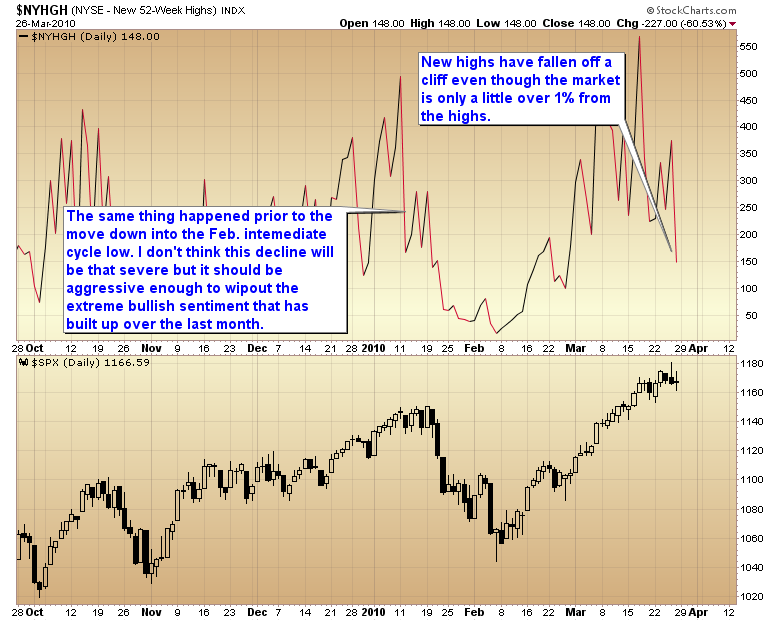 The consensus seems to be that the market will hang in till the end of the month. It may, but I tend to think we’ve probably seen about all the upside we are going to see at this point. 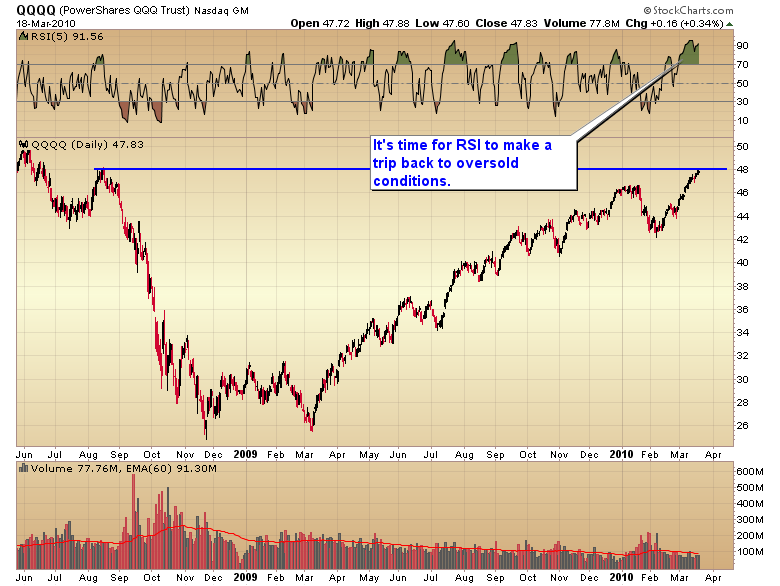 The leading tech sector is pushing up against a major resistance level. I doubt this level is going to be penetrated on the first try. Starting sometime next week the market should begin a minor profit taking correction to ease overbought technical and sentiment levels. I expect this will rub off on the precious metals sector as well (it almost always does). 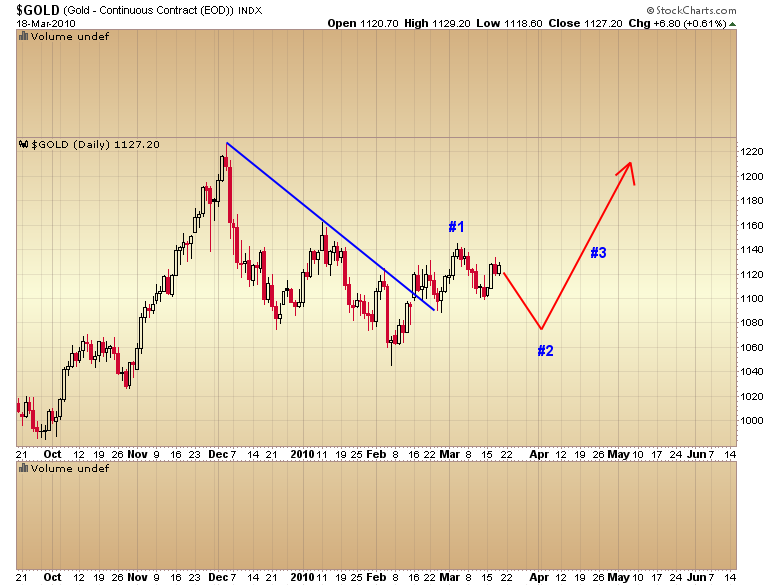 That should result in a 1-2-3 reversal process in the miners and gold. The expectation is for both gold and miners to hold above the February lows and then move to higher highs as the market rallies out of the cycle bottom. I wouldn’t be surprised if markets bottom on the next employment report on Apr. 2nd. That would allow the market to ease the overbought conditions and set it up for a powerful rally through earnings season. So I guess it’s possible the market hangs on till the end of the month but I doubt it. I suspect we are going to start to see weakness next week. This entry was posted in Uncategorized on March 19, 2010 by Gary. It’s been my contention all along that this cyclical bull would consist of at least three major legs. 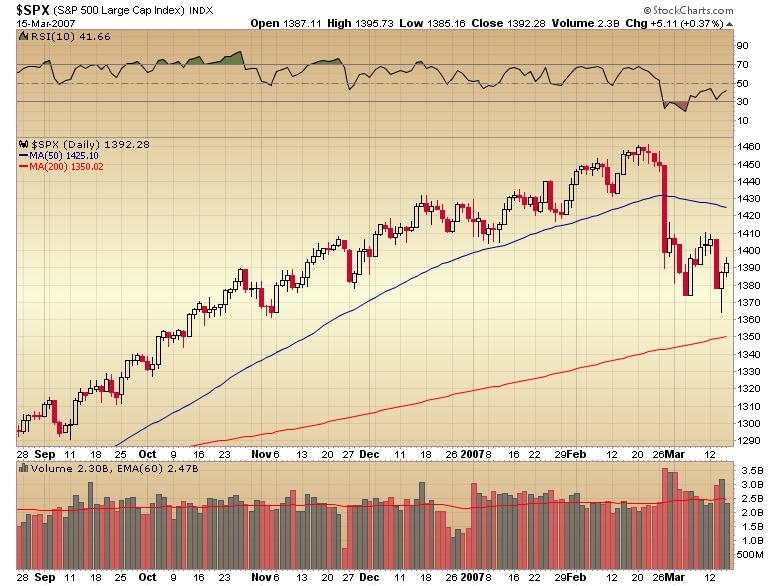 Now that the S&P has also broken to new highs I think we can safely say the third leg is underway. That being said the market is due for a move down into a daily cycle low anytime. Sentiment has become extremely bullishly skewed, breadth is deterioating and we are seeing signs that institutional traders are taking chips off the table. So I’m expecting another brief breather, probably starting next week as I think the market will probably hang in till after options expiration. The key to the next phase of this cyclical bull is as always the dollar. 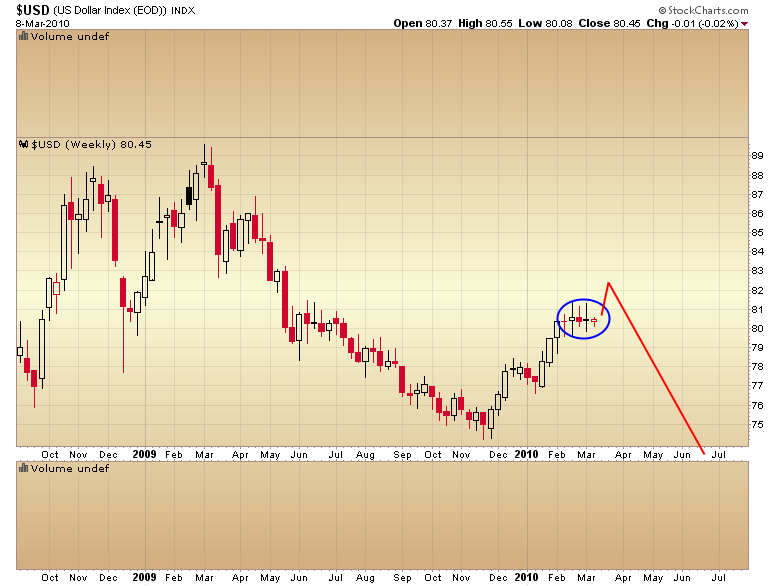 I’ve been saying for a while now that we are getting late in the dollar’s intermediate cycle. 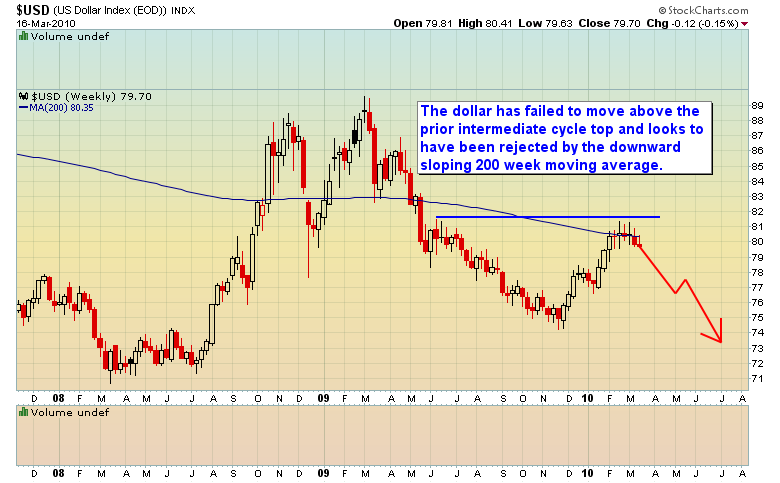 As you can see from the chart despite the powerful rally the dollar still hasn’t been able to move above the last intermediate cycle high and it now appears to be failing at the downward sloping 20 week moving average. If the dollar is about to begin the trip down into the intermediate cycle low (and I think it probably is) it’s going to act as a big tailwind for virtually every asset class. Actually I expect it’s going to be more like a hurricane driving everything willy nilly before it. Once we get through the impending correction I expect most if not all assets to enter runaway moves for the next 2 or 3 months. Unfortunately that includes the energy markets. And that my friends is going to ultimately be the fly in the ointment for Bernanke’s plan to print our way out of this mess. This entry was posted in Uncategorized on March 17, 2010 by Gary. Folks there are times when the right thing to do is to just sit and watch. This is one of those times. We really have no edge at all in the gold market right now. Gold is moving down into the daily cycle low and I expect that decline to be exacerbated when the stock market corrects. So there’s no call to try and pick a bottom at this time. We still lack two confirmations that this is a C-wave continuation, so there’s no need to buy this dip yet, epecially if this does turn out to be a D-wave as there will be a lower low by the time the next intermediate cycle bottom arrives. Now if gold can hold above the prior dip at $1087 it would be a big plus as it would keep the pattern of higher short term highs and higher short term lows intact. 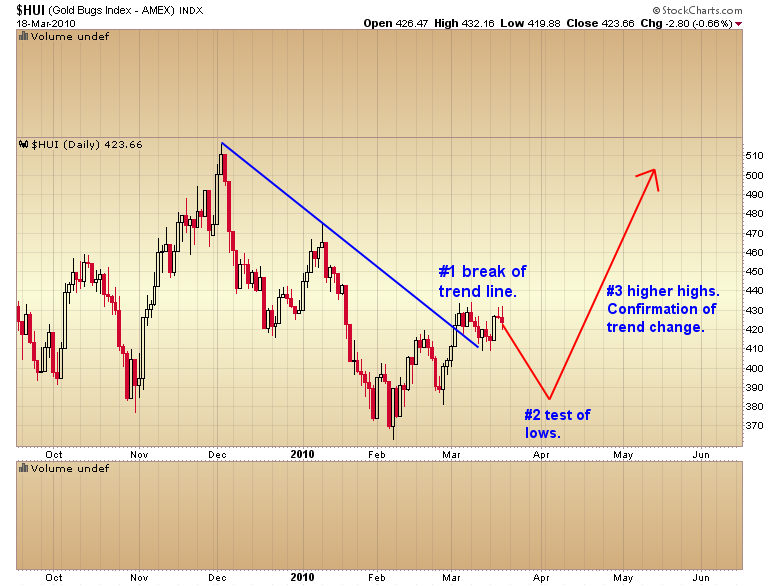 I’m not terribly confident that will happen though as the stock market hasn’t corrected yet. When it does it’s probably going to add downside pressure to gold and miners. On the plus side the right translated nature of this daily cycle swings the odds heavily in favor of gold holding above the $1044 low. So once we do put in the cycle bottom gold will have another shot at taking out the critical $1161 level. It doesn’t make sense to buy the stock market this deep into the daily cycle especially with the negative divergences and money flows popping up (more on that in last night’s update). It’s safest to just sit and wait for the correction to unfold and then buy into the dip. Shorting is probably out of the question as this is one of the most powerful bull markets in history. And it should be, with all the liquidity that’s been thrown at it. The surprises continue to come on the upside. So you are just asking to get kicked in the teeth if you are shorting anything right now. Folks I think it’s time to step back and be a spectator for a while. This entry was posted in Uncategorized on March 11, 2010 by Gary. There is an interesting pattern developing on the weekly dollar chart. For the last five weeks volatility has collapsed forming a volatility coil. As I’ve mentioned before the initial move out of a coil is a false move about 70-75% of the time. If the dollar were to break upwards out of this pattern it would probably skew dollar sentiment even more wildly bullish than it already is and potentially set up a powerful reversal and continuation of the secular bear market. Unfortunately if this does play out we can almost count on gold not taking out the critical $1161 level and the D-wave will be confirmed. In that case I would look to get aggressively long in preparation for an A-wave advance as the D-wave bottoms. This entry was posted in Uncategorized on March 9, 2010 by Gary. This morning the miners met one more confirmation that needed to happen. The point and figure chart has now turned bullish. That’s just one more tally that we can now slide over the to bull side. We’re still waiting on the two biggies. Gold still needs to break the pattern of lower lows and lower highs by moving above $1161 and the dollar needs to put in a weekly swing high as a possible sign the intermediate cycle has topped. This entry was posted in Uncategorized on March 8, 2010 by Gary.